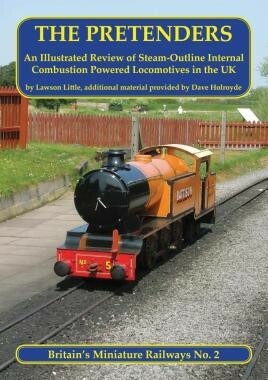 A history of steam-outline internal combustion locomotives in the UK, the book covers all gauges above 7.25". A history of steam-outline internal combustion locomotives in the UK, including chapters on iconic locomotives such as the pioneering BLACOLVESLEY and AULD REEKIE, prolific manufacturers Severn-Lamb and Alan Keef, and more mainstream locomotive manufacturers Hudswell Clarke and Baguley, as well as an Appendix listing all known miscellaneous examples. The book covers all gauges above 7.25".